One of the best things about a Texas road trip is the opportunity to discover new places to enjoy a burger far from home. I have a no fast-food rule when I am trekking across the Lone Star State. I figure that since I have to eat anyway, I may as well make every meal an adventure. And that means discovering new places to eat. 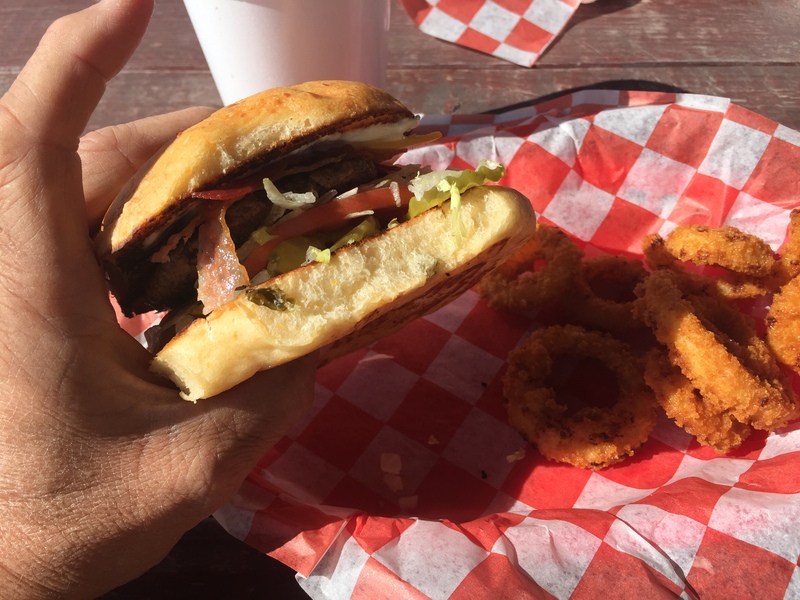 On a recent trek from my home in Katy to the Guadalupe Mountains, a buddy and I decided to find a burger joint in Kerrville. 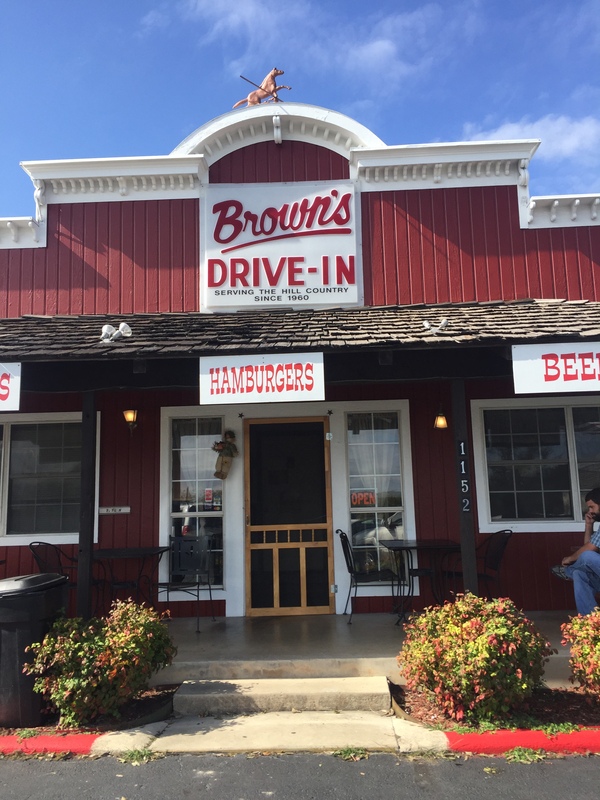 As I have done on many occasions, I asked Siri to recommend “places to eat a burger near me.” Brown’s Drive In showed up on that list and so we turned on our navigation and headed that way. Housed in a hard-to-miss red building with white trim on Sidney Baker Street South, we parked and then took our hungry selves inside. The building is modest in size and smothered in fragrant burger aroma. There is seating both inside and out and a drive-thru window that kept the staff hopping. I ordered the smaller quarter-pound bacon cheeseburger on a jalapeño infused sourdough bun. Speaking of hamburger buns, God bless whoever had the brilliant idea of putting jalapeño bits into hamburger buns. You did all true Texans a great favor by going beyond in your creative culinary pursuits. I also ordered onion rings and a glass of tea. Since the inside dining area was filled with customers, we sat at one of the picnic tables on the front porch. As for the burger, it was absolutely delicious. Everything about this burger worked well. All of the ingredients were fresh. The meat was juicy and cooked to perfection. The onion rings were crispy and tasty. All in all, this was a delicious meal. 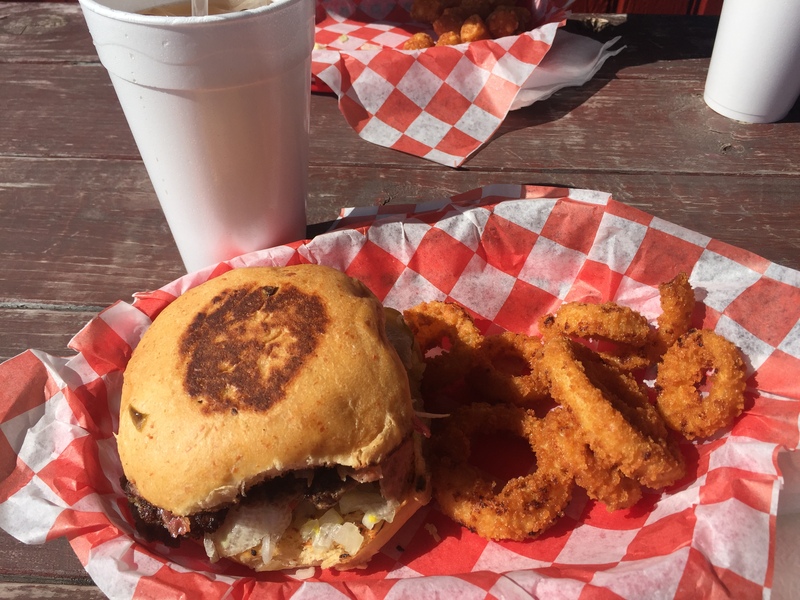 If you find yourself traveling anywhere near Kerrville at lunch time (or anytime), make it a point to stop by Brown’s and try one of their delicious burgers. They have been around for a long time, know what they’re doing, and have a loyal customer base — perhaps the best recommendation of all. This entry was posted in Places To Eat and tagged Brown's Drive In, Burger Joints, Hamburgers, Kerrville Texas. Bookmark the permalink.